BRUMADINHO, Brazil, January 28, 2019 (ENS) – The confirmed death toll rose to 60 on Monday, with just over 300 people still listed as missing after a mining waste dam at Vale SA’s Corrego do Feijao mine collapsed on Friday. The resulting mudslide buried homes and mining facilities in the town of Brumadinho in Brazil’s southeastern state of Minas Gerais on the Paraopeba River. Vale SA is a Brazilian multinational metals and mining corporation. Vale is the largest producer of iron ore and nickel in the world, and the company also produces manganese, ferroalloys, copper, bauxite, potash, kaolin, and cobalt. The plant facilities, the loading terminal, the maintenance workshops and the administrative buildings of the Córrego de Feijão mine were damaged, and there were blockages to the road access from the mine to the Córrego do Feijão village, the company said in a statement. 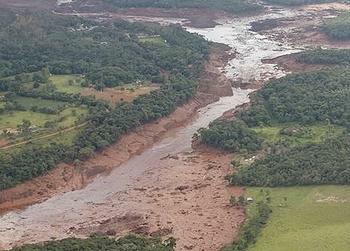 Minas Gerais state civil defense agency spokesman Flavio Godinho told reporters he expected the death toll to rise. Most of those considered missing are presumed dead, officials said. More than a dozen helicopters flew over the mudslide area on Saturday to survey the disaster and help search and rescue teams. The cause of the dam breach remains unclear. Avimar de Melo Barcelos, the mayor of Brumadinho, criticized Vale for being “careless and incompetent.” He blamed the mining company for the tragedy and the state of Minas Gerais for poor oversight, and he pledged to fine Vale 100 million reais (US$26.5 million). The Brazilian Institute for the Environment and Renewable Natural Resources (IBAMA) fined Vale R$ 250 million, for the social and environmental catastrophe that occurred last Friday in Brumadinho. Damage to the environment resulting from the rupture of the dam’s Córrego do Feijão mine has resulted in five infraction notices in the amount of R$ 50 million each, the maximum set forth inthe Environmental Crimes Law. The dam was built in 1976 by Ferteco Mineração, and it was acquired by Vale on April 27th, 2001. The dam was 86 meters high with crest length of 720 meters. But other structures of the Córrego do Feijão mine were affected by the tailings that leaked from Dam I, Vale said. Dam VI, which contains 843,000 m3 of tailings, was inspected shortly after the Dam I breach and it was verified that the structure remained within the required safety parameters, even after the impact of the tailings. Dam VI is being continuously monitored by two radars, one of which works with real-time monitoring every three minutes. On Sunday, around 5:30 pm, the siren warning was activated in the region of Córrego do Feijão mine in Brumadinho, after detecting an increase of the water levels by the measurement tools that are monitoring the Dam VI. The authorities were alerted and, as a preventive measure, the community was gathered in the meeting places previously determined by the Emergency Plan. The company is draining the Dam VI with the use of pumps, to reduce the amount of water in the reservoir and the water levels have already receded to safe levels, reducing the critical alert level from 2 to 1. With that, people who had left their homes have been allowed to return and the Civil Defense Corps have also been able to recommence their search for missing people in the region. 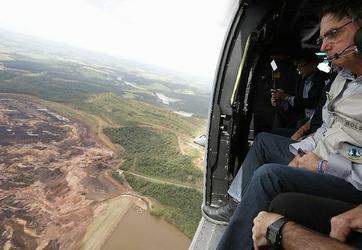 Other tailings dams in the vicinity, Dams VII and Menezes I and II, did not suffer any impact. Due to the fact that Dam I was inactive – it was not receiving any further tailings and was scheduled for decommissioning – the tailings behind the dam were relatively dry and, as a result, the movement of the tailings was limited, the company said. “What is flowing in the channel of the river is water with altered turbidity level and color. So far, as at 4:24 pm of January 27, the water reached 63 kilometers (39 miles) from the point of the dam breach,” Vale said. But the tailings are still not stable, and there may be more intense movements depending on the weather conditions, especially rainfall over the affected region, the company warned. Vale has mobilized teams for monitoring the Paraopeba River basin, for wildlife rescuing and to support sanitation measures. Brazilian President Jair Bolsonaro, announced on Saturday the creation of a 10 member Ministerial Council of Disaster Response Supervision to monitor and oversee the relief and recovery activities of the municipality of Brumadinho. Ministers include those responsible for the environment, health, defense, mines and energy, women, family and human rights and the attorney general. On Twitter, Bolsonaro informed the public that the Council has already been instituted and can carry out the activities set forth in a decree published in the Official Gazette of the Union. The committee will run for six months from January 26 and the term can be extended for an equal period. The meetings will take place weekly and extraordinary meetings can be called by the coordinator. After the closure of activities, the committee must deliver, within 60 days, a final report to Onyx Lorenzoni, President Bolsonaro’s chief of staff.